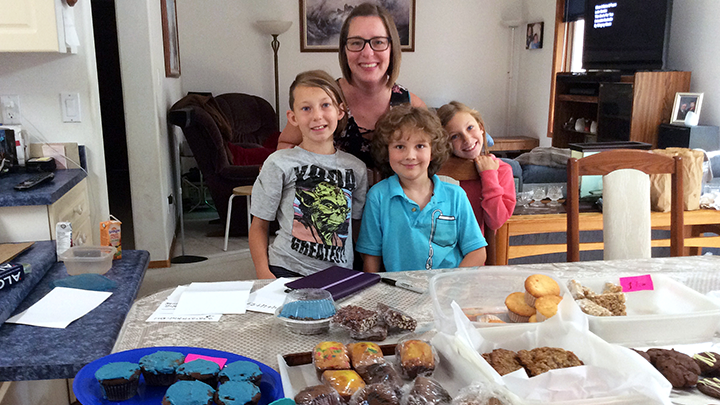 Roman Runnalls, middle, poses with Brooke, Lee and Mya Deren at Roman’s bake sale in August. Roman raised money for the Stollery Children’s Hospital. ATHABASCA — Danielle Runnalls says her eight-year-old son Roman is returning to his normal life thanks to the care he received at the Stollery Children’s Hospital in Edmonton. And for that, she is forever grateful. Earlier this year, Roman was admitted to the Stollery with brain bleeding after falling and hitting his head. Roman, a mild hemophiliac at the time, underwent surgery to stop the bleeding. Since then, Roman has been in and out of hospital. 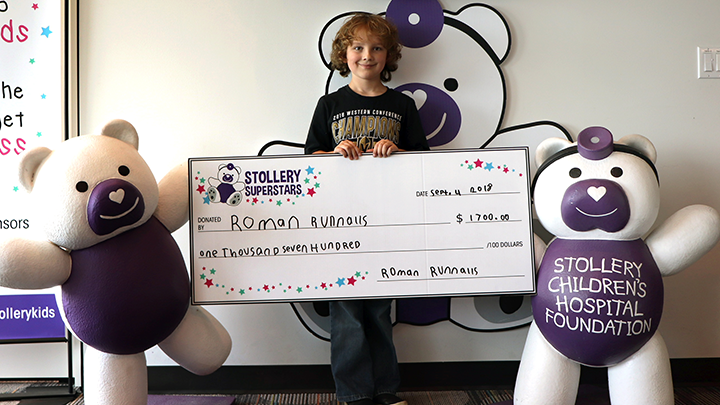 Roman Runnalls, 8, delivered a cheque to the Stollery Children’s Hospital on Sept.4. Runnalls raised the money through a bake sale to give thanks to the hospital for the care he’s received this year. “Now with his inhibitors, he's considered a severe hemophiliac. This means he gets a muscle or joint bleed from the simplest things from things like running, kicking a ball or swinging a baseball bat. We've even had to deal with spontaneous bleeds,” says Danielle, noting Roman’s health is significantly improving. His inhibitor levels are dropping and he is experiencing fewer bleeds. A few weeks ago, Roman was watching television with his grandmother, Laureen Lachance, when they both saw a commercial for the Stollery Children’s Hospital Foundation’s Mighty Millions Lottery. “I turned to Roman and I told him that I wish I could win all the money in the world so that I could cure hemophilia,” recalls Laureen. “I then asked Roman what he would do if he won the money. He thought about it for a bit and then said, ‘I wish I could cure hemophilia, but that would only help my disease. I could also give all my money to cure cancer, but that would only help cancer patients. But, I could give all that money to the Stollery Hospital and then they could help every kid, just like they helped me’." Roman wanted to do something to give back to the children’s hospital. He brainstormed with his grandmother, and they decided to do a bake sale. In August, Roman, with help from Laureen and children at his day home, spent three days baking treats such as muffins and cookies, which were available to purchase by donation. In total, Roman raised $1,700, and delivered the cheque to the hospital on Sept. 4.